It has struck me afresh how often we pay lip service to big, deep, mysterious things… but those things feel sometimes like they are for show more than anything else. In my reading for the Doctor of Ministry that I am attempting to complete with Covenant Theological Seminary, I have begun asking the question “how do we get off balance as a church in regards to how we communicate God’s story through worship?” I hope that over the coming months and years to use this blog as a platform for developing some of those ideas (at least in my own mind). Reason, science, consumerism, and marketing are the trading capital of the world in which we (most of us) live in. Consider reason and science. The popularity of classical apologetics and the virtual jettison of presupposition from the main stage of Christendom should make it clear. People don’t want “faith”. They want answers. Ideas like “mystery” and “unseen” cause people a whole lot of angst, especially when the church has become a mere amenity to their already comfortable lifestyle. So what do we do instead of giving them a biblical answer? We identify what they need (as consumers) and market to them (so that they will stay). The problem is we produce consumers instead of disciples, and the answers we give rarely have staying power, because instead of addressing root causes, we address symptoms. ‹ Working for the good of those around us. good to know you are still lurking around on the interwebs. looking forward to getting to reconnect with you this summer in STL. Interesting thought. My response is a philosophical one that probably takes the author out of context and doesn’t treat him fairly. The cynic in me says that the author himself is a product of our modern world as he uses reason and consumeristic niche writing to communicate his ideas. I hear the question behind the question, though. The Church has been entrusted with a different narrative. That narrative, in Christ, forms our identity, structures, methods, and purpose. God in his infinite wisdom has ordained that his church exist in matter, time, and space. In his redemptive providence, the trappings of pre-modernity, modernity, and post-modernity all have a place in his economy of revealing his kingdom on earth. The people of God have always used polemic in creating a tension between the kingdom of the world and the Kingdom of God. The Gospel is counter-cultural, and counter-intuitive. 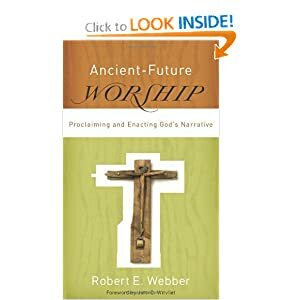 Webber benefiting from reason (thanks, Enlightenment) and niche writing demonstrate that even in the midst of flawed systems, biblical truth can still be conveyed and communicated.